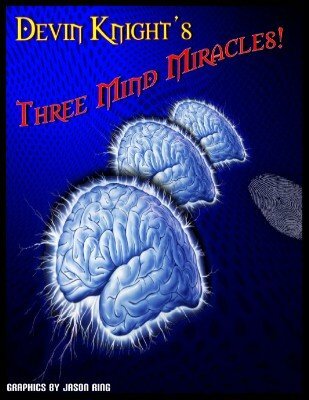 This ebook contains three effects from Devin Knight that are about as close to real mindreading as you can get. An ungimmicked Tarot Deck is shown and given to anyone to shuffle. Four people are invited to come forward. They remove the top five cards from the shuffled Tarot Deck and arrange them face up on a table in any order. They do this while you are across the room and CAN NOT SEE THE CARDS. Each person is asked to just think of one of the cards. They say nothing and write nothing down. Everyone could be thinking of the same card or each person could be thinking of a different card. It makes no difference. You start to get impressions of animals and ask anyone who is thinking of a card that has an animal on it, to close his eyes and see the animal moving in his mind. Next you get impressions of people and ask those who are thinking of a card with people on it to close their eyes and visualize the person talking. Several cards on the table may have animals in them and people. Some cards may just be symbols. The spectators say nothing, you do no fishing. They just close their eyes and concentrate. You walk over and pick up the five cards and immediately hand the thought-of card to each person. You are 100% correct! No chance of failure. Nothing to memorize, no complex formula's. All you need is a Tarot Deck. The principle can be applied to most any Tarot Deck. It appears the participants had a free choice of five cards from a shuffle tarot deck, that one of them shuffles! A red deck UNCASED is on the table. A blue deck is shown and given a real shuffle by the performer. A person selects a card from the deck in his own hands. There is NO FORCE. The choice is free and the magician does NOT touch the deck during the selection. In fact, the magician doesn't even have to see or know the card. Read that again. The person selects a card that is REALLY unknown to you! He shows it to the audience. If he doesn't like the card, he can replace it and select another card, no kidding! To ensure a random number, he counts the cards left in his hand after cutting off blocks. He counts the cards aloud. There is no force, you have no idea how many cards he will have in his hands. Assume he selected the four of clubs and the number of cards left in his hand are 22. Another person picks up the red deck which you have NOT TOUCHED and counts down from the top to the 22nd card. He always counts from the top face down. The card at position 22 is the 4 of Clubs. Baffling beyond words, and get this, NO SLEIGHTS, no math, no formulas to remember. Believe it or not, this is self-working. ULTRA-Clean. No gimmicks, just use any two decks. Performer talks of the research being done in Japan with water. He further comments that current research suggests that water can be influenced by our emotions, words and thoughts. In fact a movie based on this is coming out soon, and there are several best selling books on the subject. Many people in your audience will be familiar with all this. You offer to demonstrate. You show a clear and empty half gallon glass jug and also a pitcher of water. You have a person select a card (NO FORCE) and commit it to memory. You say, "Let's see if the water will react to certain words." You hold the inverted glass jug over the pitcher. You ask the lady to think of her card. You say RED, and nothing happens, this is repeated a few times. You say BLACK and water gushes forth, You yell RED and the water stops completely! Say BLACK again, and the water gushes. "Let's try the suits," you explain. You name all 4 suits and the water gushes forth when the right suit is named and stops when a wrong suit is named. Finally, you try it with values, and when the correct value of the card (say a 4) is named, the water gushes forth. When wrong it stops. Finally you call off a random card and nothing happens, then you say the name of the card selected AND THE WATER GUSHES FORTH UNTIL THE JUG IS EMPTY! SELF CONTAINED...NOTHING ADDED OR TAKEN AWAY. NO Clear Lucite covers used to stop water! Water can freely be poured in and out of jug, yet at anytime turn it upside down and the water defies gravity! 1st edition 2011; 18 pages.